Cheaper to Make Textiles in the United States than in China: Reality or Myth? A New York Times article back in August 2015 suggests that “yarn production costs in China are now 30 percent higher than in the United States” because of savings in raw and auxiliary material. 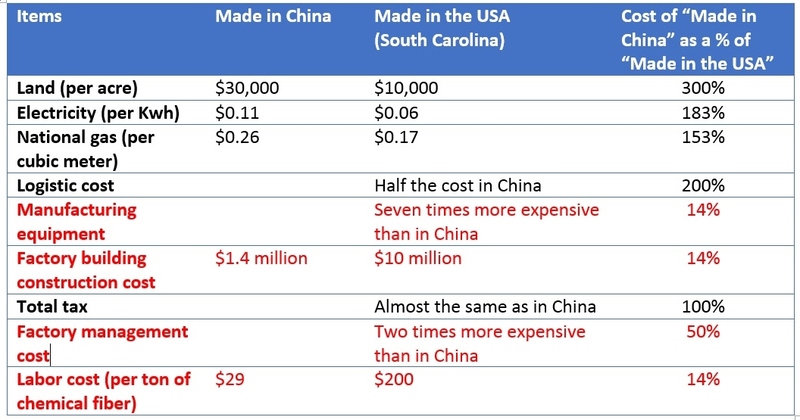 The article believes the cost difference is why some Chinese textile companies are coming to build factories in the United States, such as Keer Group’s cotton mill in South Carolina. However, in a recent interview with China Textile News, Chairman of the Cixi Jiangnan Chemical Fiber Co (Cixi) provides a different cost sheet (above). In September 2013, Cixi invested a $45million polyester staple fiber mill in South Carolina. Because nearly 80% of Cixi’s outputs are sold outside of China, and the United States is its single largest export market, the investment intends to help the company maintain its presence in the U.S. market and substantially save transportation cost. According to Cixi, it is a misunderstanding that making textiles in the United States is cheaper than in China. Although moving factories to the United States may help Chinese companies save money in land, electricity, natural gas, and logistics, it will significantly increase the costs in purchasing manufacturing equipment, building factories and managing daily operation of the company. Additionally, culture and language barriers, as well as labor policy in the United States, could also become critical challenges facing Chinese investors. Cixi admits that to keep its U.S. factory running smoothly, members of its management team all come from China. This is a very interesting article! When most people think of textiles factories, the majority of people will place them in China. The reason is because it is seemed to be cheaper than manufacturing in the US. I am curious as to if this article did make a difference in companies opinions about outsourcing their manufacturing. I found this article extremely eye-opening, many would assume that because something is produced in China it has to be cheaper compared to producing it the United States. However, in 2014 with the cost to manufacture yarn that was not the case but rather the opposite. Producing yarn in the United States was actually about 35% cheaper than china, which is something that doesn’t seemed to be talked about a lot when discussing the cost of producing fibers. I think American workers have a relatively high level of education and high productivity, and are particularly suited to high-end manufacturing, such as car parts and consumer electronics. If Chinese companies need to have high-quality workers or need to be close to American consumers without a large pool of cheap labor, it makes sense to make them in the United States. This is the case with cotton spinning, which is highly automated and does not require a lot of labor. Labor-intensive industries such as sewn garments still depend on low-wage workers in places like Bangladesh, Vietnam and Mexico, and those types of jobs will not return to the United States anytime soon. In fact, I was very surprised by this article. I had always felt that China was the cheapest manufacturing in the world, but that was not the case. With the progress and development of the society, China’s prices are rising rapidly and the cost is higher. In order to maintain the competitive advantage, it is necessary to control the cost in the premise of ensuring the quality. There is an old Chinese saying that “The tasty orange, grown in southern China, would turn sour once it is grownin the north.” This shows that different environments and regions are suitable for the development of different industries. As reported in the report, “yarn production costs in China are now 30 percent higher than in the United States” because of savings in raw and auxiliary material. suggesting that the United States is more suitable for producing yarn. So I still believe it’s a fact. Reading this article I start to wonder, with the opposing views that manufacturing in the US is more expensive or less expensive overall maybe they are just about equal. Where you would save money in land, electricity, natural gas, and logistics over the years in the US could it almost amount to how much you would save with cheaper manufacturing equipment, building factories and managing daily operation of the company in China. The more I learn about global politics I realize my knowledge on the subject is mostly dictated by perceptions. I did not know that it is 7 times more expensive to have manufacturing equipment in China. I think in order for me to not make “misunderstandings” I need to look at the facts such as this financial sheet. Especially in a day and age where the media and politicians can over expose a topic or hide in the dark based on their opinion on the subject. I think this article pushes me to see that answers are never surface level and we have to read between the lines. It is interesting to see the pros and cons of China v.s U.S based solely on costs. For example, we all are discussing how about costs and technology impose cost challenges for U.S and China. However, Cixi stated some of their biggest challenges are on the human level. Still culture and language barriers and labor policies are all challenges for Chinese Investors. These cultural issues all play in affect when thinking about the time, energy and productivity of a company. The U.S does have the advantage of English as a globally spoken language. Chinese investors feel the language barrier can stand in the way therefore investors believe the only way for the factory to run smoothly is to have a team of Chinese management to run it. It will be interesting to see if there is a trend of companies that try to expand to the U.S or if China is still the best option. I am surprised that U.S. textiles cost less than China, I supposed that China produce everything with low cost. The low cost of American Textiles may be the less amount required labor force for automatics, and the better and efficient technologies. However, I think that Chinese manufactories in U.S. will not lower the cost meanwhile they will face more culture shocks and language barrier distinguish in U.S, for example Mardi Gras: Made in China. The only way to for China to survive in the global textile is to improve the technologies or others. I find this article very interesting. I had always believed that manufacturing anything in China was the cheapest option for apparel companies, but after reading this article I’ve learned this is not the case. What really surprised me was that “yarn production costs in China are now 30 percent higher than in the United States.” This is significantly higher, but it’s also important to consider all of the other factors in moving production from China to the US. So many different factors come into play when it comes to textile manufacturing and it’s interesting to see that even though yarn production costs in China are more expensive than the US, it may not mean that moving production to the US is the best move. This article was very interesting. The title alone grabbed my attention. Like most people, I assumed that everything is cheaper in China- which is why we manufacture and source from there- but according to this article, that is not necessarily the case. The article claims that “yarn production costs in China are now 30% higher than in the United States.” This is significantly higher, but I think it’s important to consider all of the other factors in moving production from China to the US. Although moving production to the US will save money in land, raw and auxiliary material, it will increase the costs in purchasing manufacturing equipment, building factories and managing daily operation of the company. There will also be a language barrier. 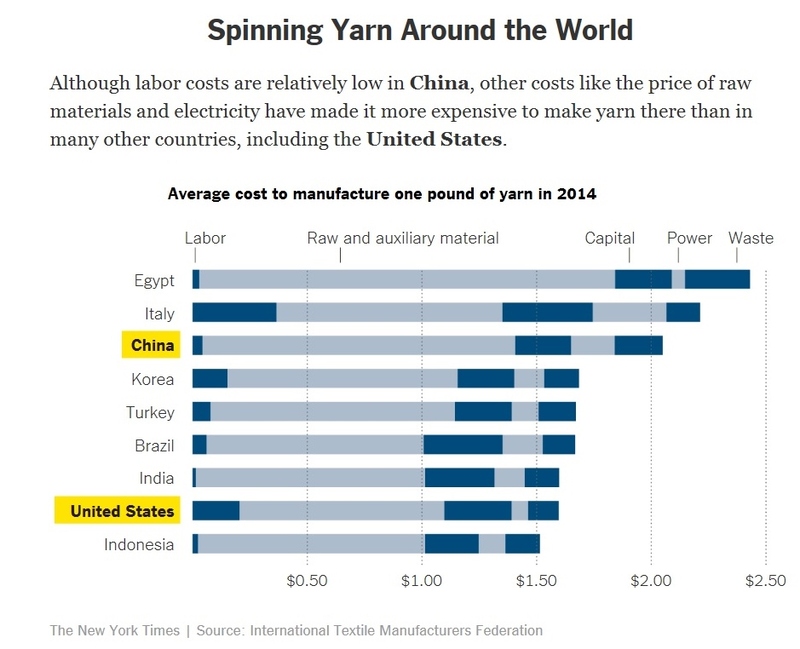 Even though yarn production costs in China are more expensive than the US, I don’t think moving production to the US is the best move when considering all other factors. This article is somewhat surprising mainly because the basic premise is the antithesis of of my assumptions. The article states that most people assume that it is cheaper to manufacture in the U.S. rather than China. I think that most people, including me, think the opposite is true. China has a reputation for making cheap products and making products cheaply. The article basically confirmed that understanding and the conclusion was not surprising.